The aim is to place the some numbers from the list (3, 7, 9, 11, 13, 17, 67, 71, 74, 75) into the empty squares and squares marked with A, B an C. Sum of each row and column should be equal. 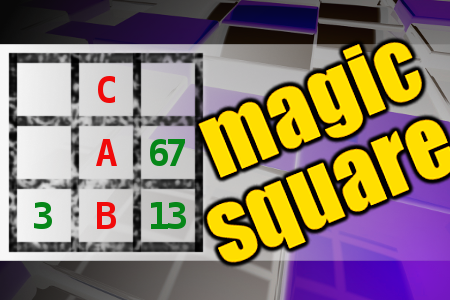 All the numbers of the magic square must be different. Find values for A, B, and C. Solution is A+B*C.